As many of you know, I love to travel. Planning a trip is almost as fun, for me, as actually going on the trip. I have been visiting Springdale, Utah and Zion National Park for almost fifteen years now. Each time, a new part of the park and surrounding area opens itself to me. Springdale still has it's charming, small-town feel, even after a record 4.2 million people visited Zion National Park this year. It has resisted the commercialization that some other national park gateway towns have succumbed to (I'm looking at you, Moab). I am always pleasantly surprised when I find a hidden gem in a place I think I know like the back of my hand. Kings Landing Bistro is the latest treasure I dug up when planning this last trip to Zion National Park. Chef Thomas King learned much of his trade in the culinary capital of Las Vegas. I felt that Chef King would be a kindred spirit when I read that he had his Level I Cicerone and was attempting Level II, something I hope to attain this year. I mentioned this restaurant find to my dad while we were planning our trip, and he agreed to add it to the itinerary, which was a feat in itself! I often joke that I am pretentious when it comes to food and beer. Well, I get that from my father. He won't try a new restaurant unless it's gotten rave reviews from someone he knows. By him agreeing to try King's Landing without any further information, I felt the earth shift a little off its axis. We decided to try King's Landing after completing the bottom-up Subway hike in the Zion Wilderness. Clocking in at nine miles, which we finished in roughly seven hours, we were ready for a reward of gastronomical delights after that hike. Walking into King's Landing Bistro, one feels a little lighter and at ease immediately. The low ambient light soothes the eyes while they rest on different pieces of art hung throughout the restaurant. Large windows give unobstructed views of Zion canyon, a grand centerpiece for any venue. The staff was warm, attentive, and knowledgeable, which is a must in any situation. I was delighted to find Uinta Monkshine on the bottled beer list. One of my favorites, Monkshine has not been available in Green Bay before (although as of last week, Brickhouse Craft Burgers and Brews brought in a barrel because someone put a bug in their ear...). Upon arrival, we mentioned to our waiter that we had brought some beer to share with the chef if he would have time later in the evening. Beer friends have to stick together. The winter seasonal food menu was both interesting and exciting. Any foodie can take a look at a menu and decide right away whether someone with at least half a brain is operating the kitchen, or if there's a wannabe in an apron behind the line. My dad and I were both happily surprised with the offerings. We shared the duck salad to start, a wonderfully savory dish brightened by a champagne pomegranate vinaigrette and local apples. I fell in love with the rib eye, paired with brussels sprouts, butternut squash, pomegranate, and borderlaise. My dad was impressed with the roasted chicken breast, a juicy dish presented with sausage, corn, and peppers. Anyone can slap a chicken dish on a menu, but it takes a skilled chef to make a chicken entree that is moist and flavorful. A well-executed meal is a tribute to the person running the show. With a dinner this thoughtfully put together, it was clear that Chef King was intelligent, mindful, and creative. We were not disappointed when we had the opportunity to share some brews with him after our meal. It's hard to describe the feelings when you meet someone who shares your culinary interests and passion for beer. I would think that the three of us were glowing a little brighter and our laughter rang a little clearer, but that could have been the beer talking as well. Chef King brought out a Dogfish Head World Wide Stout 2012 from his cellar, a total treat that we were honored to share. His youngest daughter sat on his knee and smelled our beers, chiming in to the conversation whenever she got the chance. I can only imagine this is what I looked like growing up in my family's restaurant, although I surely was not as adorable as little Evelyn! With empty bottles and full bellies, Chef King asked that we return the next evening as he wanted to prepare a tasting menu for us paired with carefully selected brews. The next evening, we were greeted by the King's Landing crew like old friends. We sat at the bar and had the pleasure of meeting Chef King's partner and better half, Chef Nguyen. Their eldest daughter, Hannah, joined in the festivities as well. It would be hard to say what was more enjoyable, the kind and wonderful company, or the amazing meal that was laid before us. We were delighted with a six-course meal paired with rare, well-loved, and cellared beers both parties had brought. I can't pretend to remember exactly which beers and courses paired together because, well, the libations were sitting well with us by the end of the night. 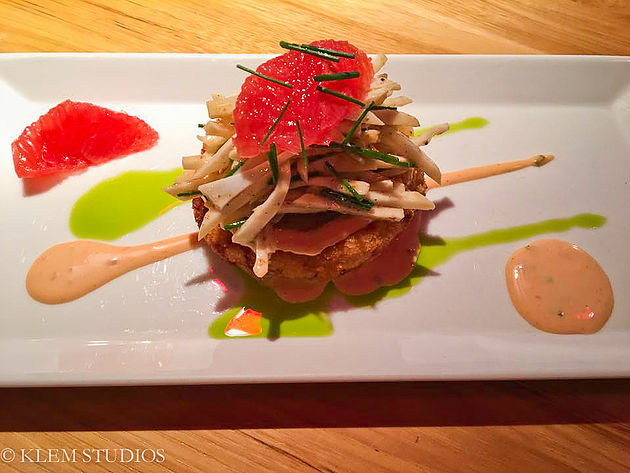 Our meal began with a delectable lump crab cake beautifully accented with grapefruit and housemade sauces. 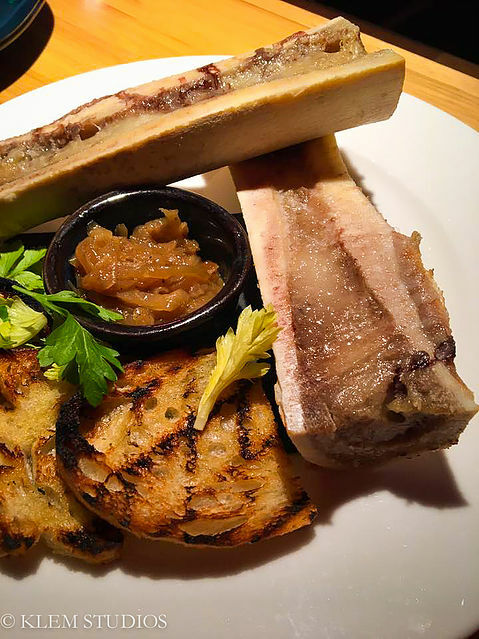 We were then treated to a bone marrow dish, which was my first time indulging in the delicacy. Plates were whisked away at the completion of the course, quickly replaced by charred Spanish octopus. I still have dreams about those crispy, mouthwatering tentacles! Not to be outdone, the salmon that greeted us after was complex but harmonious and attempted to steal the spotlight. 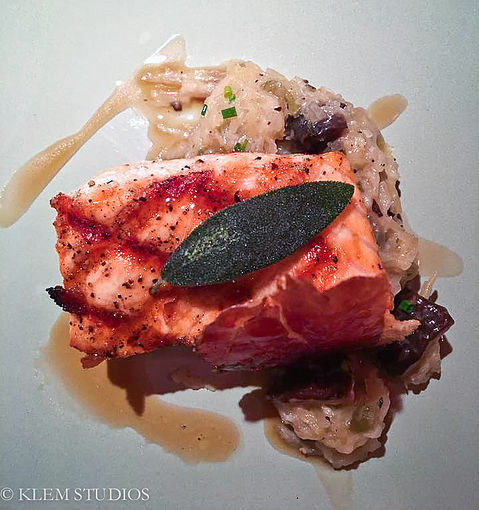 Seated atop spaghetti squash and adorned with a speck chip and a bourbon barrel aged barley wine maple glaze, the salmon was an elegant gal sure to seduce any pursuer. However, the ribeye from the previous night marched back into our lives and I was smitten once again. A perfectly prepared steak is the way to any carnivore's heart, I would think. Our meal was crowned with a soufflé that we covered in homemade creme anglaise and chocolate sauce. If I could bathe in that dish, I think I would have. Throughout the evening, we enjoyed Squatter's Fifth Element, North Coast Brewing's Brothers Thelonious, Island Brewing Company's 15th Anniversary Ale, and Deschutes Brewery's Black Butte XXV. Obvious as it may be, this was a foodie and beer snob's heaven, and we were lucky enough to leave with not only satisfied palates, but with budding friendships as well. I think there are certain people we're meant to cross paths with in our lives, and it's interesting to look back on the journey that got us there. A want for something more from the Springdale dining scene led to a Google search which lead to a website and an "About Me" section which lead to dinners and an experience we won't soon forget. Chef King and Chef Nguyen, we can't thank you enough for those two dinners, the companionship, and the shared conversations. You're building an establishment to be proud of, and I can't wait to stop in again when I'm in Springdale this May! *I very much wanted to enjoy our tasting menu without going into work mode, so please excuse the quality of the iPhone photos from our lovely meal!